#SmarkSurvey (5/27/15): Who Are The Greatest Non-WWE Wrestlers In The World Today? - Smark Henry | The voice of Filipino wrestling fans | Philippine Wrestling Revolution, WWE, and more #SmarkSurvey (5/27/15): Who Are The Greatest Non-WWE Wrestlers In The World Today? #SmarkSurvey (5/27/15): Who Are The Greatest Non-WWE Wrestlers In The World Today? 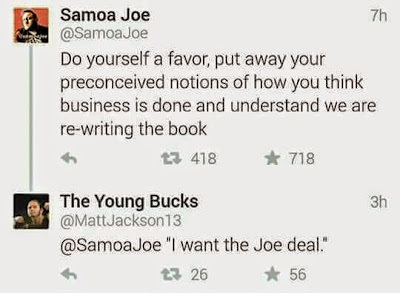 With yesterday's breaking news on what looks like an unprecedented non-exclusive NXT contract for Samoa Joe (or, as we like to call him in the Smark Gilas-Pilipinas community, "Polynesia Bob"), you have to be pretty intrigued over how the entire wrestling industry will react. 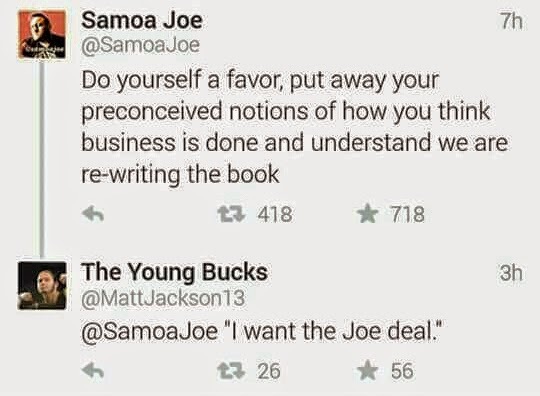 Hey, if even the notoriously anti-WWE Young Bucks can joke about getting a "Joe Deal," then that's got to be a good sign, right? Who do you think are the five greatest non-WWE wrestlers in the world today? Protip: Think about true greatness, and not just who your current favorites are. Are they great in delivering promos? Charisma? In-ring skills? An impeccable championship pedigree? If so, then we'd love to hear you out. Any wrestler not currently on the WWE or NXT rosters is fair game, even if he used to be signed with them in the past. If a wrestler got a tryout match but not a contract, he's still eligible too. Leave us a comment with your top five votes, and we'll publish the results soon!